San Rafael, Calif.—Retailers, restaurants and wineries all saw sales increases in 2015, swelling the size of the market for U.S. wine to more than $38 billion. 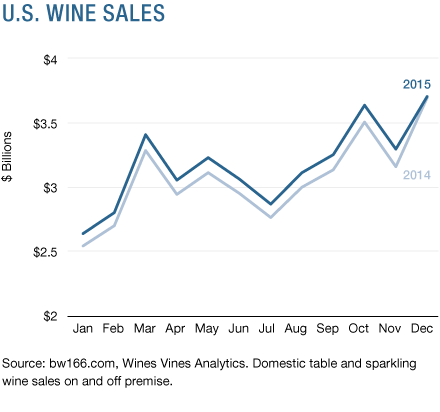 Year-end data also confirmed the strength of trends toward higher price segments and thriving sparkling wine sales. The regular Wine Industry Metrics reports by Wines Vines Analytics now include data on the entire U.S. wine market thanks to a new partnership with market research firm BW166. The company’s managing partner, Jon Moramarco, said that 2015 consumer expenditures on U.S. wine in all channels including on-premise and off-premise (of which direct-to-consumer is a component) grew by 3%, or $1.3 billion. BW166 reported that the value of on-premise domestic wine sales rose by 9% to $12.9 billion, while off-premise value rose just 1% to $25.2 billion. The split by channel was 34% on-premise and 66% off-premise. Including imports, U.S. consumers spent $53 billion on wine in 2015. BW166 began issuing reports in May 2015 and Moramarco said the goal is to “collect and make available the most accurate data on not just wine entering distribution, but the value of wine, beer and spirits sales.” His subscribers are wine and spirits producers, some distributors of both, and a mix of private equity investors and bankers. Moramarco has worked for wine and spirits companies his whole career, including Allied-Domecq, Constellation and Winebow. He has operated as a CEO of various companies for more than 20 years with net sales spanning from $50 million to more than $1 billion. The company’s name has a story behind it. Giuseppe Moramarco, Jon’s grandfather, acquired Bonded Winery 166 from the Jesuits during Prohibition. This winery was known as California Mission Vintage Company and was located in downtown Los Angeles. U.S. direct-to-consumer shipments grew 7% in December to reach $177 million and the 12-month total hit $1.97 billion. Off-premise sales in the IRI channel also increased 7% and totaled $837 million while the 12-month total came to $8.4 billion. December is typically the strongest month for off-premise sales, and according to the Chicago-based market research firm IRI the growth in value of December sales was coupled with a 4% increase in volume to 10,321,871 cases. Value rising faster than volume indicates a higher average price per bottle, and indeed the domestic bottle price rose $.22 to $6.27. The data continued to show “premiumization,” the term that’s become current for consumers moving up to brands in higher price segments. For example, the lowest three IRI price segments for domestic wine either shrank in dollars or grew by less than 3%, while the four segments priced at $8 or higher grew at rates ranging from 11% to 23%. Unlike off-premise sales, DtC sales tend to slow down in December. Total shipments, however, stayed higher than in December 2014 and volume reached 427,616 cases. DtC sales have grown rapidly in the past four years and nearly reached $2 billion in 2015. The value of all shipments has increased 47% since 2011. The channel is led by small wineries producing 5,000 to 49,000 cases per year. These wineries shipped 1.9 million cases worth $933 million. Wineries producing 50,000 to 499,999 shipped 1.4 million cases worth $443 million. The largest wine companies, or those producing more than 500,000 cases per year, shipped only 234,103 cases worth $69 million in 2015. Data on DtC shipment volume and value are collected through a model developed by ShipCompliant and Wines Vines Analytics. A detailed report on 12 months of DtC figures is published each year. Visit shipcompliant.com to sign up for the full 2016 DtC report to be released next week.